Used for all flash memory types. (NAND, NOR, eMMC) To open file, tick the check box and click "..." which will bring file open dialog. Used only for NAND flash memory type. All RIFF NAND files have both main and spare data combined into single file, so this field is to be used only in case that You have Your own Spare data file. With usual RIFF operations this field is NOT USED ! ! ! This option is to be used only with NAND files, previously read from working device. Only RIFF files are valid ! 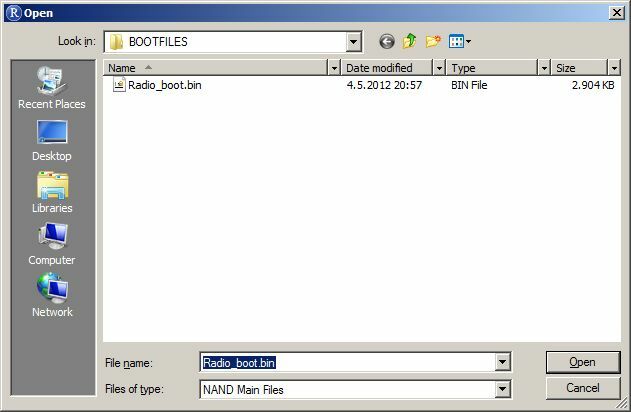 In above sample "Radio_boot.bin" file contains both main and spare data, combined into single file. This option is to be used in case that You need to write specific address range from full or partial flash image. For example, You have full flash image, and You want to write range from 0x000 0020 0000 and length 0x0000 0001 0000 to target device. This way You can "clone" sectors from one device to another, without waste of time by flashing full flash image. For any Read/Write/Erase operation, starting address and data length must be supplied. Address field value is used as starting address, and Data Length field value determines size. Both fields use hex format, devided into groups of four digits, for easier handling. Once You open file You want to use, and in case that You want to write whole file, simply select "File Size" from drop down menu. File size will be automagically read and inserted in Data Length field. In this case, correct sequence should be: Open File -> Enter Address -> Select "File Size" from list. Clicking to blue arrow will bring list with pre-defined size. You can select any range from 1MB to 16GB. Simply enter desired value using numeric keys on keyboard. MCU Address space is internal CPU ROM, and as such it's read only. Furthermore, in many CPU-s access to this address space is restricted or blocked. For average user, this address space is of no use. This is most important address space in practical use. Since many devices can have more then one phisycal flash memory chip, or, in case of eMMC more than one partition, they can be accessed by selecting different ROM number. Most important if, of course, ROM1 address space, and it's main memory address space in all devices. It's possible to select total of 8 ROM address spaces in RIFF JTAG Manager. This option is used to automatically read flash chip size and apply values to address and length fields. When this option is checked, it disables address, data length fields, and "Use end address" option. This option is used instead of data length. Basically it does the same job, just instead of size, end address is provided. This option is to be used only with NAND memory chips. It's function is to enable DCC loader to generate NAND spare data. RIFF files have already spare data included, so this option is not required with RIFF files. It should be used only in case where file contains only main data, and no spare. For example, data extracted from firmware files. Used to execute "Save" command, once read operation is finished successfully. It will open "Save File" dialog, where user can enter file name and select save location. When Main file field check box is checked, this button transforms into "Write Flash", and it's used to execute "Write" Command. 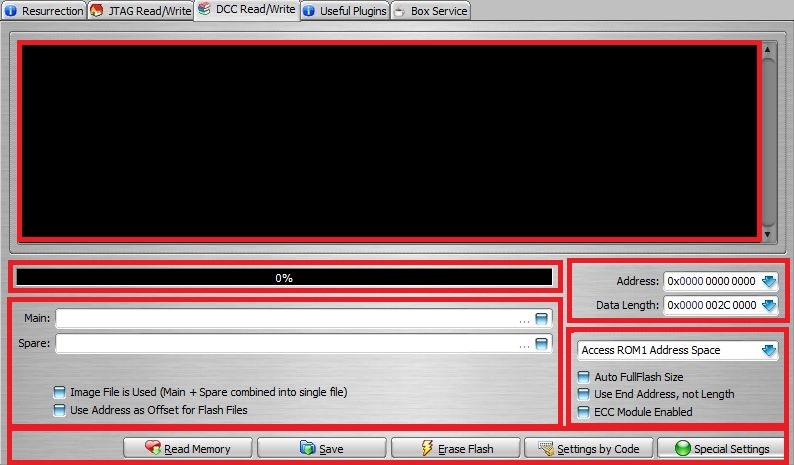 When Main file field check box is un-checked, this button transforms into "Erase Flash", and it's used to execute "Erase" command. Tricky, huh ? DO NOT use "Erase" function with eMMC chips ! ! ! Pre-defined preset is used to automatically set correct all required settings and options. Settings by code -> Select pre-defined preset -> Apply code -> Execute desired function. Each time any operation is executed, settings code is generated, shown in log window and stored in log file. This code can be decoded into options and settings used for specific operation. We use it in case that users report some problems, to diagnose if user made some mistake in settings and options. This code can be applied to new session, thus making life easier for RIFF users. Settings by Code -> Select "Read Full Image from NAND/NOR/eMMC Memory" preset ->Apply Code -> Read Memory. As You can see, ROM1 address space and Auto Fullflash size options is selected. Other options are irrelevant for read memory functions. Once reading is finished, simply click "Save" button to save the file. Open desired file -> Settings by Code -> Select Preset (Write NAND or NOR/eMMC) -> Apply Settings -> Write Flash. Important options and settings are ROM1 Address space, Auto FullFlash Size. All other options are irrelevant. Important settings and options are ROM1 Address Space, Auto FullFlash Image and Image File is Used. ECC Module option MUST BE DISABLED ! ! ! Settings by Code -> Select Erase Full NAND/NOR memory -> Apply Code -> Erase Flash. Erasing of eMMC memory chip is intentionally disabled. Due to specific eMMC memory architecture and data structure, erasing any part of it can cause more damage than good. This is why, even if erase function is executed, actually no data will be erased, but there can be some unpredicted results, like eMMC firmware lockup due to bugs in eMMC firmwares ! ! !